Actress and singer Hailee Steinfeld decided to wear a casual, yet, stylish ensemble as she was photographed at a fan meet up in Hyde Park in London, England on October 1, 2015. The 18-year-old was wearing leather pants with a simple T-shirt and a long coat. Hailee wore black leather pants that she paired with dark grey T-shirt, while she also wore a black coat. She slipped her feet into a pair of white sneakers, and kept her look really simple as she decided not to wear much accessories and makeup. She looked fantastic! Wearing her glossy locks hanging loose around her shoulders, Hailee highlighted her features with peach eyeshadow, few swipes of eyeliner and mascara and a slick of peach glossy lipstick. 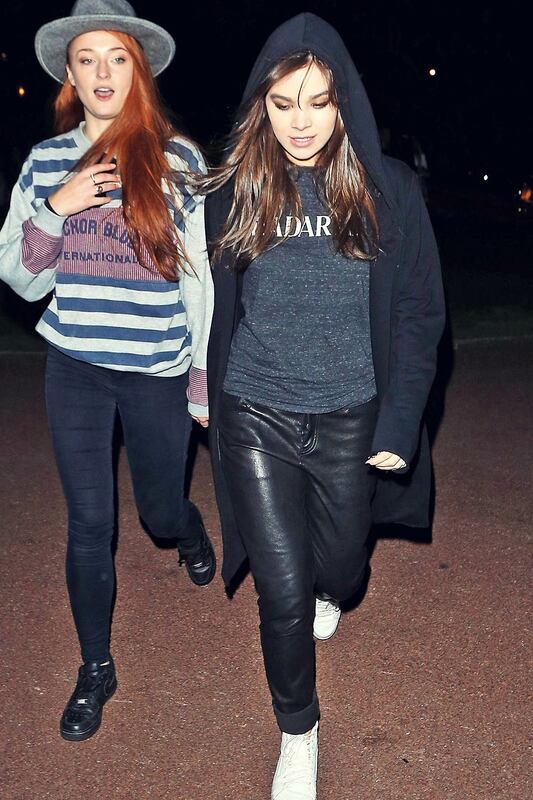 Hailee looked happier than ever as she posed for the pictures with Sophie Turner.